I have a house with little kids and that means a house full of toys and epic battles. I had no idea that they would enjoy Star Wars as much as I did growing up. But over 20 years later, I see Yoda, Storm Troopers, R2-D2 engaged in life and death struggles in a galaxy not so far away - mainly my living room, hallway and stairways. They live again! But now there are new characters and twists. Obi-Wan Kenobi is no longer "old Ben" but a spry Ewan MacGregor. And stormtroopers are no longer faceless imperial bad guys but cool clones with names and selfless jobs serving the Republic. And Anakin is still "Ani." Sure he has anger issues and is prone to being rash but far from being Darth Vader. And everyone plays - my 10 year old son, 8 year old daughter and even my soon-to-be 4 year old son. The battles are truly epic and span every corner of the universe - I mean - our house. No one is safe from this cruel civil war. Green Army Men, Lego castle knights, squires, and ladies, Lego pirates, Indiana Jones, and even the Fisher Price Little People Farm and Dollhouse. Sadly, in this war there is no one neutral - you fight or the fight is brought to you. Although I must say that the Farmer has turned out to be quite a good General. Who knew? 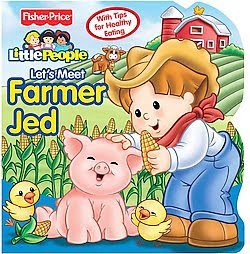 I have since found out that he is really Farmer Jed...or is that really Farmer Jedi? But perhaps the biggest surprise has been from the youngest member of our family. He had a Count Dooku action figure. (Please note - that is "action figure" because boys don't play with dolls. These are ALL "action figures.") But everyone knows that Count Dooku is a Sith Lord, not very nice, and an all around bad guy. No one wants to play a bad guy at this age because they always lose. So, my youngest let me in on an incredible revelation. Count Dooku has an identical brother, unknown up to this point, but which I now reveal to you. I reveal his good-guy brother --- Count Cooku. I think he likes Cocoa Puffs too but that part is a little unclear. Anyway, Count Cooku has been a tremendous asset to the Republic and his knowledge of the Force has been instrumental to the success of many battles. So all is well in my part of the galaxy that is far, far away. I do have some friends that work for Lucas - on the Clone Wars as a matter of fact. My keen observation has sparked some new story lines that I am going to suggest to them. "Attack over the Little People Farmhouse," or "General Jed Returns to the Farm" or "Count Cooku and the Crisis over Cocoa Puffs..." OK, it needs work but there might be something there.